T&D are Main UK Stockists for the Cembre range of copper compression connectors (cable crimp lugs and splices) for low voltage cable crimping applications. Cembre cable crimp lug ranges include : transformer cable lugs, single hole cable lugs, 2 hole cable lugs, narrow palm cable lugs, Ceetaps (C Taps) and reducer crimps. This includes copper, aluminium and bi-metallic Cembre crimp connectors to suit all cable termination, jointing and electrical applications. T&D also offer competitive prices for Burndy, Mecatraction, Panduit, Thomas & Betts, Klauke and Prysmian (BICC BICON) ranges of cable lugs, splices, terminals and connectors. Quality - Cembre crimp lugs are manufactured from electrolytic copper tube - the copper tube dimensions are designed to obtain the most efficient conductivity and mechanical strength to resist vibration and pull out. Strength - Cembre crimp lugs are annealed to guarantee optimum ductility which is an absolute necessity for crimp connectors which must withstand the severe deformation arsing when compressed by hydraulic crimp tools. In electrical installations subject to vibration, crimp terminals must perform a reliable connection - annealing avoids cracking or breaks between the cable lug palm and barrel. Reliability - Cembre crimp lugs feature an inspection hole facilitating full insertion of the the copper conductor into the crimp lug - the cable lug barrel length has been designed to allow easy and accurate positioning of the dies during the crimping operation. Compression (crimp) connectors are an established method of connecting and terminating low voltage cable conductors. To ensure a reliable connection or termination, the following should be observed. *The correct compression or crimping sequence must be followed and the full compression pressure applied. Tin plated cable lugs provide superior and extended service in industrial, hazardous and offshore installations - tin plating is recommended for corrosive atmospheres (offshore, marine, oil, gas, petrochem and water industries). Noxious gases or liquids overtime attack surfaces of copper cable lugs which potentially can cause serious electrical and mechanical performance overtime. 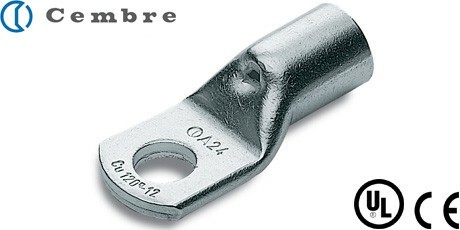 Cembre tin-plated cable lugs resist corrosion degradation for stable electrical cable connections.